Foundress of the Discalced Carmelites, 1560-62. Canonized by Gregory XV, 1622; declared a Doctor of the Church in 1970. One of the most charismatic of the Church's counter-reformation saints, Teresa Sanchez Cepeda Davila y Ahumada was born the daughter of a saintly and literate father, Don Alonso, and a pious mother. At fifteen, after her mother's death and the marriage of her oldest sister, Teresa was sent to be educated with Augustinian nuns, but after an illness she returned to live with her father and other relatives. An uncle acquainted her with the Letters of Saint Jerome, which led her to pursue religious life. At the age of 20 Teresa joined the Carmelite Convent of the Incarnation at Avila. Teresa's convent at Avila was no exception. Although she had been devout at first, she lost this fervor and embraced the lax life of her convent. After the death of her father, and several serious illnesses, however, she was led to reform herself through intense prayer, and began to have religious experiences which she, and the priests she consulted, thought were delusions. Two Jesuit confessors, however, believed Teresa's experiences were genuine graces, and advised her to lay a firm spiritual foundation through private prayer and the profound practice of virtue. During this time, she had even more intense and extraordinary experiences of "heavenly communications" -- including "mystical marriage", or the "espousal" of her soul to the person of Christ -- and even bodily manifestations of her spiritual elevation. Her confessors ordered her to write her experiences of the spiritual necessity for prayer, the practice of contemplative prayer, and its fruits. She wrote the Way of Perfection and Foundations for her nuns, and The Interior Castle, as a guide for all. It was principally for these writings that she was declared a Doctor of the Church four centuries later. Her writings are intensely personal spiritual autobiographies, based on her own experiences and insights, and are remarkably clearly written. They remain spiritual classics -- along with Saint Augustine's Confessions. Inspired by a niece, who was also a Carmelite at Avila, she decided to undertake the establishment of a reformed convent that would be restored to the austerity and devotion of earlier times. This effort met strong opposition from several quarters. 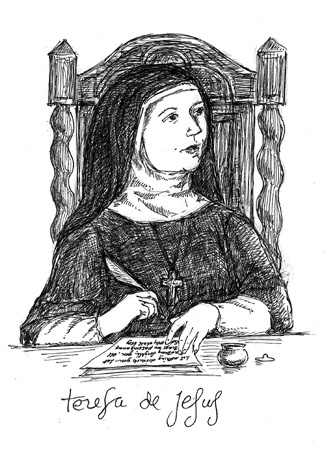 In 1562, Teresa received approval for a new foundation, the Discalced Carmelite Nuns of the Primitive Rule of Saint Joseph, at Avila, which she began with with her niece and three other nuns. Several years later, while she was establishing a new convent in Toledo, she met John Yepes (later John of the Cross), and soon after made new foundations for men that were eventually placed under his care. Difficulties and opposition to the newly established reformed Discalced Carmelite foundations persisted. ("Discalced", literally "shoeless", refers to the austerity of the new foundations. The nuns and friars wore sandals instead of shoes). Finally, in 1580, the separation of the Discalced Carmelites from the other Carmelites was recognized by the Holy See -- when Teresa was sixty-five years old, and in poor health. Teresa made seventeen foundations of the Discalced Carmelites, her last at Burgos in July, 1582. Instead of returning to Avila from Burgos, she set out for Alba de Tormes. It was a difficult trip and she was ill. Three days after reaching Alba, she died -- on October 4, 1582, and was buried there. The next day the Gregorian reform of the calendar was effected, which resulted in dropping ten days. Thus her feast is fixed on October 15. St. Theresa’s most popularly known writing is a brief poem is known as her “Bookmark”, because it was found in her prayer book after her death in 1582. It has been variously translated into English, and has been very widely circulated. La pacientia todo lo alcanza. and fired with longing for true holiness. We know that the whole creation has been groaning in travail together until now; and not only the creation, but we ourselves, who have the first fruits of the Spirit, groan inwardly as we wait for adoption as sons, the redemption of our bodies. For in this hope we were saved. Now hope that is seen is not hope. For who hopes for what he sees? But if we hope for what we do not see, we wait for it with patience. from A Continual Feast by Evelyn Birge Vitz, originally published by Harper & Row in 1995, now available in paperback from Ignatius Press. Our catechesis today deals with Saint Teresa of Avila, the great sixteenth-century Carmelite reformer proclaimed a Doctor of the Church by Pope Paul VI. Teresa entered the Carmel in Avila at the age of twenty. Maturing in the spiritual life, she embraced the ideal of a renewal of her Order and with the support of Saint John of the Cross she founded a chain of reformed Carmels throughout Spain. Her highly influential writings, which include the Autobiography, The Way of Perfection and The Interior Castle, reveal her profound christocentric spirituality and her breadth of human experience. Teresa considered the evangelical and human virtues the basis of an authentic Christian life. She identified deeply with Christ in his humanity and stressed the importance of contemplation of his Passion and of his real presence in the Eucharist. She presents prayer as an intimate friendship with Christ leading to an ever greater union of love with the Blessed Trinity. In her life and in her death Teresa embodied an unconditional love for the Church. May the example and prayers of Saint Teresa of Avila inspire us to greater fidelity to prayer and, through prayer, to greater love for the Lord and his Church, and more perfect charity towards our brothers and sisters.